4 Piece Custom Pastry Sampler in a Cartoon Box for sale. Buy online at Zingerman's Mail Order. Gourmet Gifts. Food Gifts. Zingerman's fat, wallet-sized brownies. Huge, all-natural cookies. Luscious, buttery scones and more rare treats. Now you can take your pick. Create your own assortment of Zingerman's scones, cookies, brownies, and other luscious treats. Use the menus below to choose the pastries you'd like. 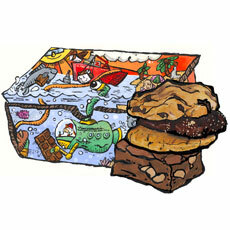 Your selection is hand packed to order in our fun, cartooned gift box.